Although it seems to defy logic, building a home right next to an eroding beach may be a good idea in some cases. 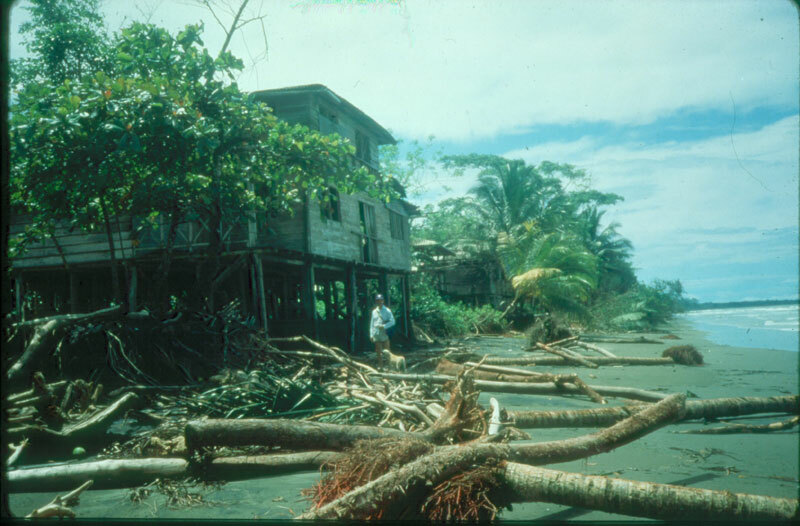 When the two of us, along with Jaime Martinez and Juan Gonzalez, were studying the Colombia’s Pacific Coast barrier islands, we visited a couple of small villages perched on the edge of rapidly eroding beaches (Martinez, et al., 1995). In one instance we watched as a house was being dismantled to be moved back. Local people told us that two men could dismantle and move most of the village houses in a matter of weeks (figure 1). At the time, they were keeping the village in the retreating back-beach position, yielding to beach retreat of a few meters per month due to extra high spring tides during an El Niño (figures 2 and 3). We described the nature of these beautiful tropical beaches in our August 1, 2011, Beach-of-the-Month article. Although there is a good sand supply coming via rivers from the nearby Andes Mountains, a combination of high wave energy, sea level rise due to global climate change, regional effects of seismic activity and El Niños, and local subsidence, cause beach retreat (shoreline transgression). The black to dark gray sandy beaches are littered with fallen trees, drift wood, and wrack lines of flotsam. 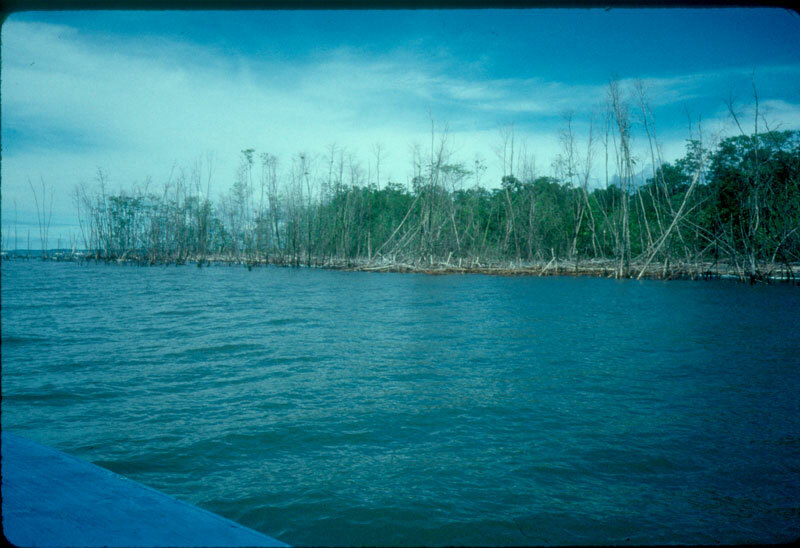 Stands of mangrove forest that grew behind barrier beaches are now dead or dying (Figure 4). At first the high-risk location of these villages didn’t make any sense to us. Why should the locals live so dangerously? After a few days, however, we began to understand. Living in such a remote area, the villagers had no means of communication with the outside world, no phones, and no radios. The law and medical help were a long way away. Malaria-transmitting mosquitoes inhabit the nearby rain forest. 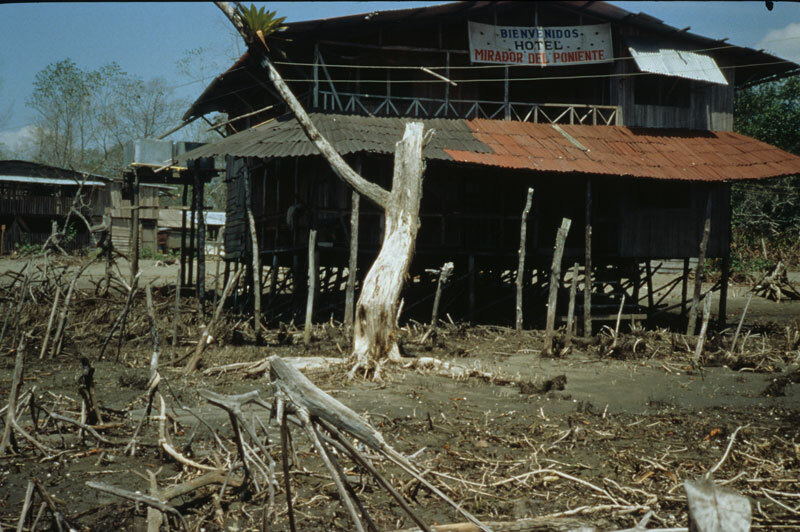 Ivan Correa and Juan Gonzalez summed up the reasons for such village sites in their 2000 article. •	The villagers know at any time the sea and weather conditions, in order to plan activities. •	The possibility exists of having eye contact with fishing teams at a short distance offshore (in dugout canoes). assistance in an emergency, especially useful because of the lack of radios. especially to keep malaria-transmitting mosquitoes away. Erosion rates along this coast are sporadic. Periods of stability of a few years are followed by catastrophic erosion and/or transgression rates resulting from earthquakes on the adjacent continental shelf (e.g., Tumaco, 1979) (See Correa and Morton, 2010, for a review of Colombia’s Pacific Coast). On Soldado Island along the central portion of the coast, we found that local sea level rise could be as high as 10 feet per century. As noted above, times of El Niño also accelerate the erosion rate. Different strokes for different folks. 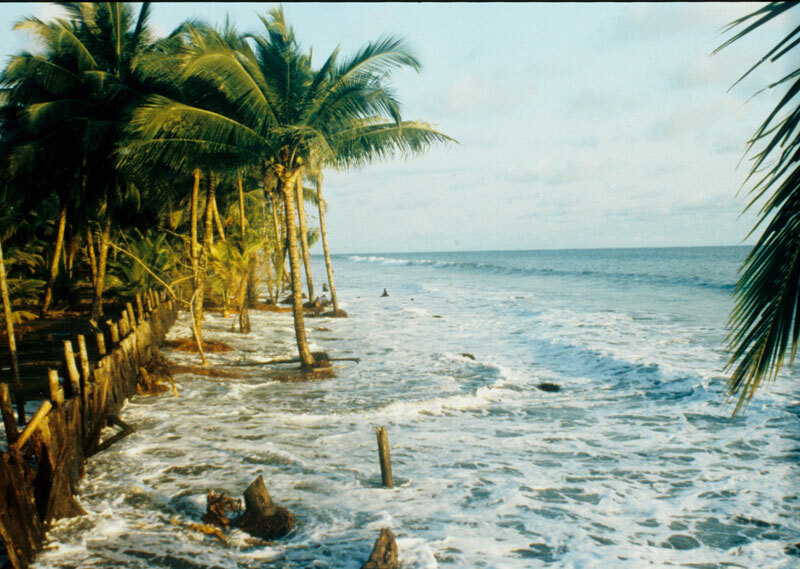 In the remote Pacific coast of Colombia, beachfront development has been a necessity. But even there in a subsistence economy that depends on being next to the sea, the rising sea level is changing this option. 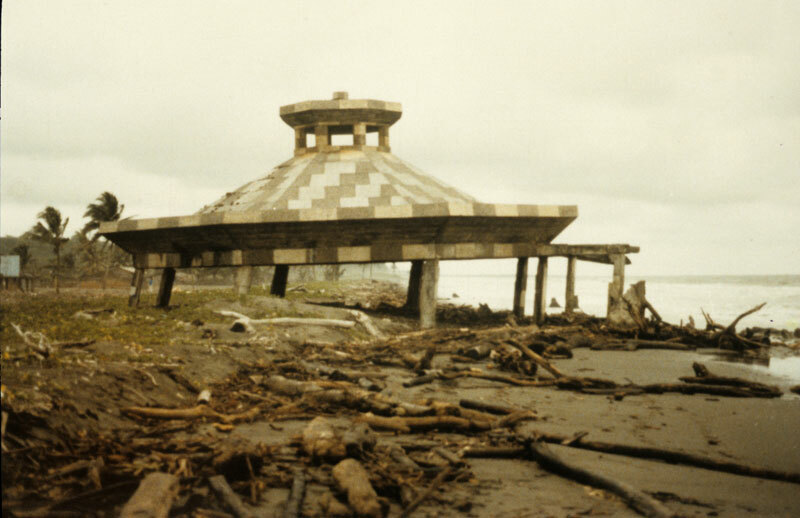 As Correa and Gonzalez note, the village of El Choncho that had persisted for 91 years, being moved laterally or back from the retreating beach as necessary, finally had to move inland to a higher elevation in 1997. The move, however, was facilitated by the fact that all of the dwellings were built in such a way that they could be easily disassembled and reconstructed in a short period of time, and at a low cost. Not so in the first world where beachfront development is placed in high-risk zones by choice, rather than necessity, and increasingly using construction that does not favor being easily moved out of harm’s of way in the future. 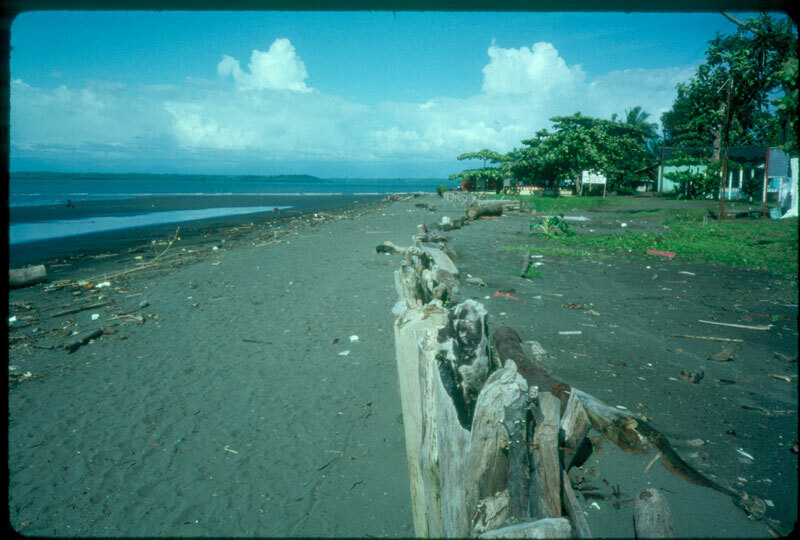 Even though widespread awareness of the importance of impending sea level rise is only a couple of decades old, post WWII beachfront development in the first world usually took place on shorelines that were clearly retreating. In a time of rising sea level we can only view such beachfront development as imprudent and irresponsible. 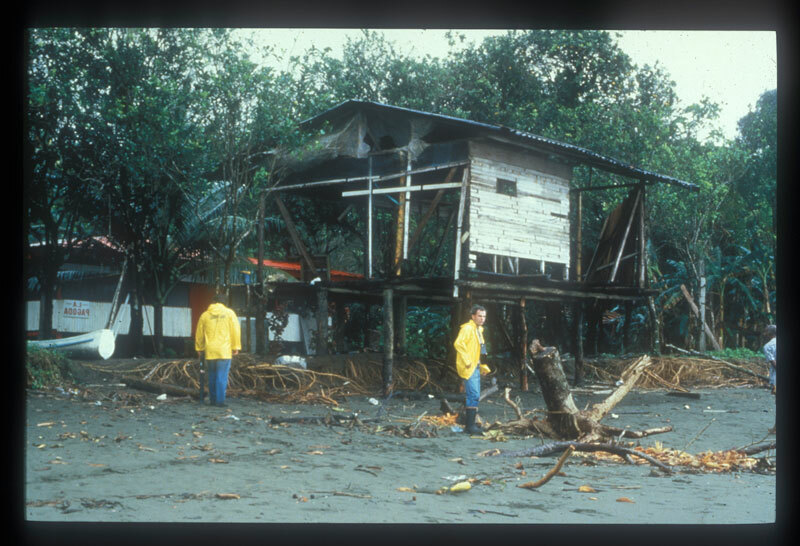 Correa, Ivan D. and Gonzalez, Juan Luis, 2000, Coastal Erosion and Village relocation: A Colombian case study: Ocean and Coastal Management, 51 – 64. Correa, I. D., and Morton, R. A., 2010, Coasts of Colombia: U. S. Geological Survey. Martinez,J., Gonzalez J., Pilkey, O.H. 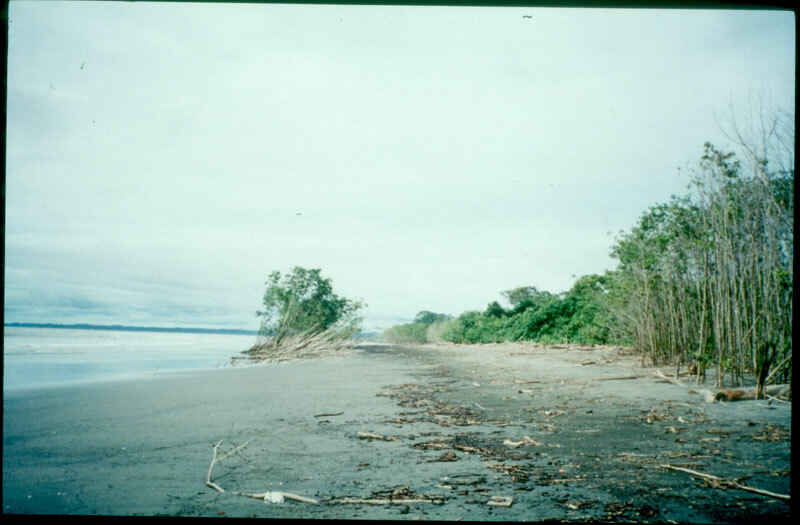 and Neal W.J, 1995, Tropical Barrier Islands of Colombia’s Pacific Coast: Journal of Coastal Research, 432 – 453. 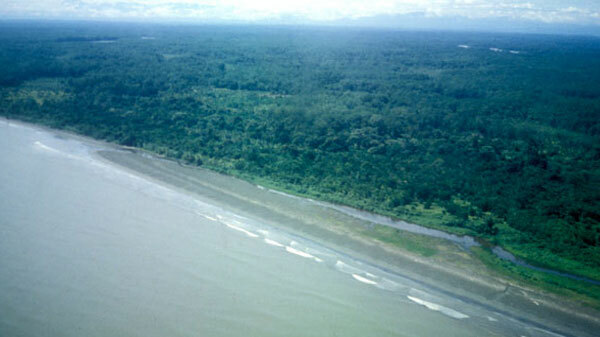 Among the world’s most remote beaches are those that line the 62 barrier islands of Colombia’s Pacific Coast. Only two roads lead over the Andes to access points from which the islands and their few, very small, subsistence coastal villages can be reached by boat.